In a lawsuit that will inspire and galvanize many other indigenous communities across the Amazon for years to come, the Kofan of Sinangoe have won a trial against four Ecuadorian ministries and agencies for having granted or attempted to grant more than 30,000 hectares of mining concessions in pristine Amazonian rainforest on the border of their ancestral land without their free, prior and informed consent. The destructive mining operations that were taking place within these concessions threatened not only the Kofan’s lives, culture and health, but also those of the countless communities located downriver. In a historic decision on Friday July 27th 2018, a regional judge accepted the evidence provided by the community, charged the government with not having consulted the Kofan, and suspended all mining activity in more than 52 concessions in the headwaters of the Aguarico River. 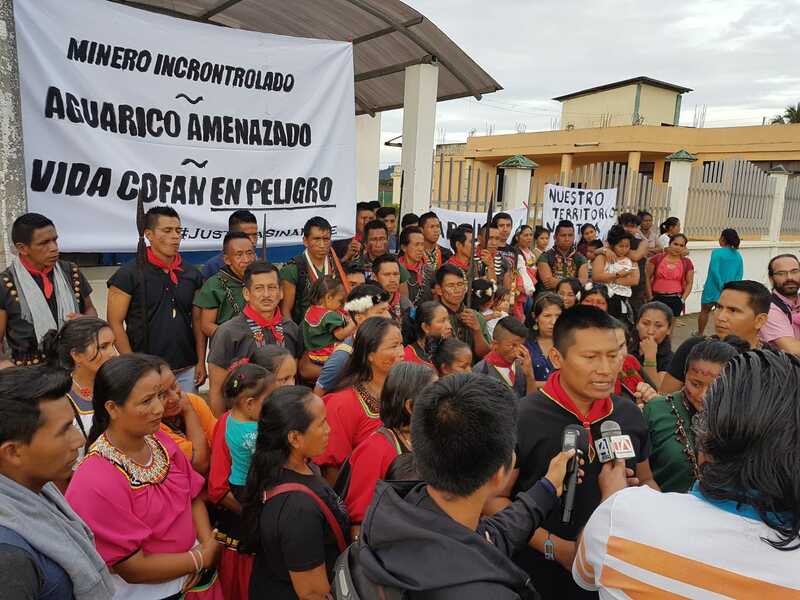 The decision was immediately appealed by all the authorities involved, and then by Sinangoe and their ally in the Defensoria del Pueblo, who seek an even tougher verdict recognizing that rights to health, water and a clean environment had also been violated. The case will be brought before a provincial judge in August, 2018. Like in many places around the world, the Ecuadorian government has a mining claim system built to facilitate any interested party in purchasing cheap concessions— maximizing foreign interests and accelerating the approval process. Although both Ecuador’s Mining Act and the Constitution recognize the need for Free, Prior and Informed Consent from stakeholder communities for mining operations, it is still mostly a theoretical concept ignored by Ecuadorian agencies. Hence Sinangoe’s lawsuit. According to the experts heard over the course of the legal process, the Mining ministry leaves the “consultation” to the mining company or the concession owners themselves, which in turn have no legal obligation to consult with local people, and often will perform their “consultation” through a phone call or by handing out a simple information pamphlet. 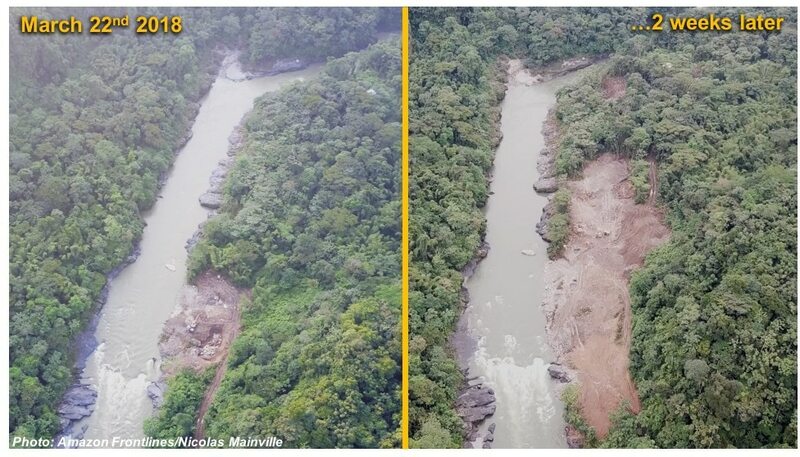 In the case of Sinangoe, it was when machines started tearing up the riverbed of the Aguarico looking for gold that the community learned about the new concessions. The Environment ministry, on the other end, stipulated in the courtroom that it is not responsible for consulting with communities impacted by mining. Interestingly, according to the Mining Act, the Environment Ministry needs to grant environmental licenses before operations can begin, unless the granting process takes more than 6 months, in which case – as unbelievable as this is – the permits are automatically granted to the operators. So basically, via a very simple bureaucratic process involving nothing more than paperwork, a mining operator can very quickly obtain 20 to 25-year land claims within 6 months, while the impacted communities living downstream haven’t even heard about the concessions. This is a loophole the judge described as a violation of the right to free, prior and informed consent, a verdict that will help many other communities facing the same threats in a country where gold mining is booming. 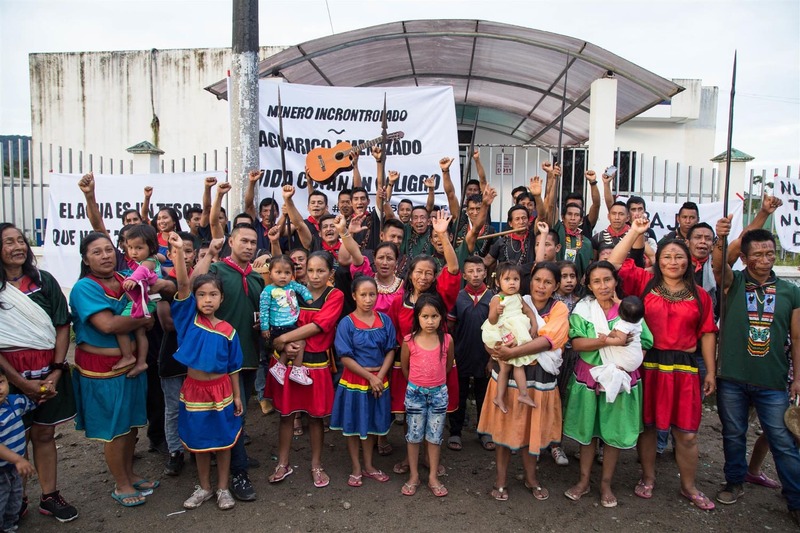 The community of Sinangoe gathered in front of the courtroom in Lumbaqui (Succumbíos) on July 27th 2018. Throughout the lawsuit, the ministries’ lawyers vigorously tried to destroy Sinangoe’s evidence, credibility, ownership of and ancestral claims to the land. They downplayed the environmental damage documented by Sinangoe, claiming that the Kofan aren’t impacted by the mining operations because their land is on the other side of the river and that legal mining has minimal footprint on the environment. However, Sinangoe had done what will likely inspire many other communities: they had documented every step made by the miners through rigorous and systematic monitoring using high tech mapping, filming, archiving all evidence, and then they used legal tactics to pressure every single level of government to act to stop the operations. Systematic recording of all the different types of evidence helped build a solid case against a negligent concession-granting system. Once in the courtroom, Sinangoe had accrued such a massive body of evidence of environmental damage and inaction on the part of the government that the judge requested a field inspection, a key event that helped him understand the scale of the damage already done, showed the deep connection the Kofan have with the area transformed into mining concessions, discredited the ministries’ arguments, and also allowed him to witness the sheer beauty of the area at risk. To the officials sitting in their offices in Quito, these concessions were nothing more than coordinates and squares on a map, but to the Kofan who live across the riverbank, the area is a place imbued with life, history, sustenance, stories and so much more. To grant concessions without experiencing the place in and of itself, either through field visits or proper consultation with the people who inhabit and use the territory, is a transgression of the inherent value of sites so rich in history and biodiversity. Sinangoe’s strength has been put to trial, and the community’s perseverance and conviction have provided them a first legal victory and attracted support from various indigenous and human rights organization across the country. With all ministries involved appealing the judgment, the Kofan will need more strength and support to navigate the next wave of legal governmental intimidation. Alex Lucitante, Kofan human rights defender, engaging with the media after the historic legal victory. 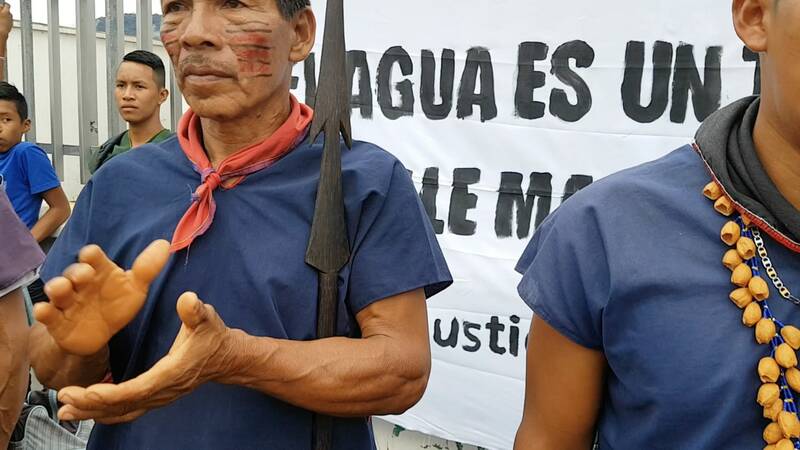 Sign the pledge in support of Sinangoe and stay tuned for more on our work to defend rights, lands and life in the Amazon. This article was originally published at Amazon Frontlines.